Pure Clover Honey flavored with Real Wild Elderberry Juice. Great natural way to sweeten tea & coffee. Elegant labeling makes for a perfect gift. 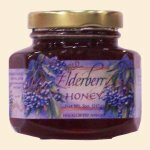 Enjoy this great taste in our Elderberry Jelly too. Ingredients: Clover Honey, Wild Elderberry Juice. We would be glad to ship international orders, please contact our office at 800-774-8257 or (406) 756-5525 for a shipping quote....please do not order through the website.